Margaret Thatcher has died. Though much will be said about her legacy in the coming days, it is worthy to note the historical moment in which she emerged. The 70s was a time of expanded rights, increased union power and growth of the welfare state. 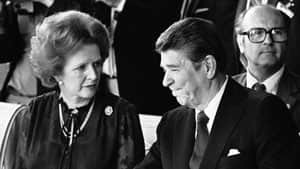 It was also a time of poor economic conditions, in which the price of oil skyrocketed and unemployment was high, so it is obvious why a figures like Reagan and Thatcher would have appeal. They cut spending and made promises of leaner, more effective government. The reality was quite different. The economic policies of these two figures set the stage for the current crisis. By introducing "supply side" economics, the rich became vastly wealthy over the past 30 years, and the gap between the haves and have-nots has turned into a chasm. Privatization of state assets was the game back then, and as a result more corporate influence has permeated into every aspect of governance; putting the interests of business ahead of those of the individual. The rhetoric of the 80s was one of "self-reliance" and "small government", which really meant that the social safety net people relied on would be attacked and destroyed, and they were successful. Banks were deregulated, corporate taxes cut, and workers trampled. Thatcher's world did not include any sympathy for the poor. In the following decades, the short term economic benefits to corporations would reach their zenith, until the eventual collapse of 2008, in which the banking sector and the housing market were brought back to Earth. But nothing was learned. In spite of such a disastrous outcome for the policies of Thatcher and Reagan; the EU, IMF, and other Neo-Liberal organizations continue to push the failed concept that drastic cuts and corporate welfare are the only solutions to avoid economic catastrophe. But austerity simply does not work, and never has. It didn't work in the 80s when there was a massive recession, nor will it work now in Spain or Greece, where saving the banks is seen as the top priority over providing health care or employment assistance. Now is not the time for Thatcher's milk snatching.